ASH vs EVIL DEAD serves up gore and gags Saturday nights on the Starz channel. 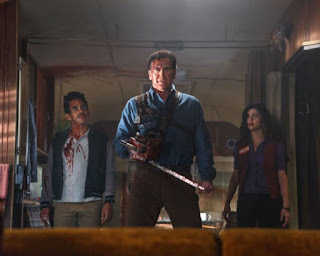 Ash, gleefully played by Bruce Campbell, is a big, boneheaded teen-ager trapped in the one-handed, paunchy body of a new AARP cardholder. Ash is a hot mess of a monster hunter in Michigan. He kills zombies with a chainsaw where his hand used to be. He has two young sidekicks who work with him in a hardware store. Ray Santiago is Pablo. 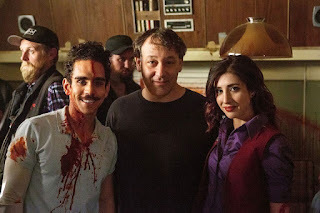 Dana DeLorenzo is Kelly. 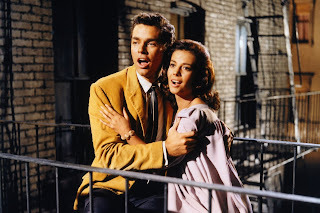 Ray is a handsome, charismatic Puerto Rican New Yorker with no shortage of acting skills. And his hair seems to have a life of its own. Pablo sees Ash as heroic and inspirational. DeLorenzo as Kelly doesn't. The actress gives you life with her deadpan expressions and wisecracks. Ray Santiago and Dana DeLorenzo deserve to be breakout stars on this series. They're a lively couple battling the evil dead with Ash. I absolutely loved meeting them both shortly before the series premiered on Starz. Ray has spent about ten years in Hollywood determined to make it as an actor. Sam Raimi, director of the hit Spider-Man movies, directed the series premiere episode that aired on Halloween night. Here he is with Ray and Dana. I wonder if any agent ever submitted Ray to audition for the Peter Parker role in Spider-Man. He's got a boyish, all-American look to me. But, like yours truly, he heard a constant chorus of "No" from agents. Then, one day, he was riding through Hollywood, looked up and saw his face on a billboard promoting the TV show. Bravo, Ray! When I met the two young actors for the above TV interview, I congratulated them for being employed actors. I could congratulate them again. 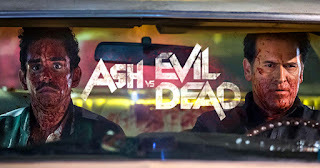 Ash vs Evil Dead has been picked up for a second season. 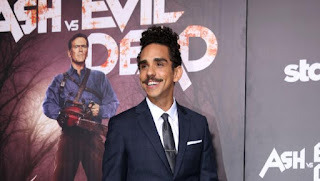 Enjoy my few minutes with Ray Santiago and Dana DeLorenzo -- and enjoy the creepy characters and wisecracks of Ash vs Evil Dead Saturday nights at 9:00 on Starz.